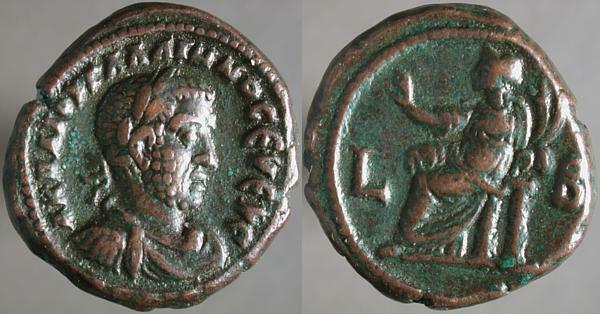 IMP GALLIENVS P F AVG GERM, Laureate cuirassed bust right | RESTITVTOR ORBIS, Emperor standing in military garb right, holding scepter right, raising kneeling figure left. S_C across fields. A big sestertius, misshapen as sestertii of this era tend to be. It's not clear why these coins were made so out-of-round. Earlier sestertii were relatively round, large provincials of this time were relatively round, later large imperial Æs were relatively round. Even at this time, they did sometimes turn out a round sestertius, as this coin, with the same reverse, minted at the same time, for Valerian. The GERM on the obverse legend indicates that Gallienus has taken the title Germanicus to celebrate victory over the Germans, and the legend on the reverse declares that he's restored the world, so he's got that going for him. ΚΟΡΝΗΛΙΑΝ C_ΑΛΩΝΙΝΑ, Diademed draped bust right, crescent behind shoulders | ΤΑΡCΟV ΜΗΤΡ_ΟΠΟΛ, Aphrodite (of Praxiteles), head right. Α / Μ / Κ in left field, Γ / Γ in right. Aphrodite is equivalent to the Roman Venus, seen here yesterday. I can't find any evidence that the original Aphrodite of Praxiteles was ever at Tarsus, so perhaps this coin shows an ancient copy. The original is lost, but clearly it was a very popular work, as many ancient copies still exist. 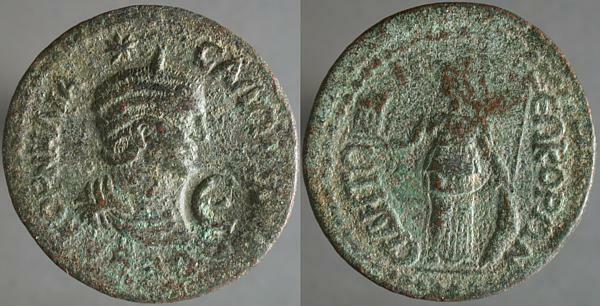 SALONINA AVG, Diademed draped bust right | VENVS GENETRIX, Venus standing facing, head left, holding scepter right and helmet left. Child at feet left. The ugly surface texture is porosity, not uncommon when the badly debased silver of this era is buried in the ground for many centuries: the high copper content is more easily dissolved, leaving behind a lattice of silver, underweight and fragile. IMP CAES DOMIT AVG GERM P M TR P VIIII, Laureate head right | IMP XXI COS XV CENS P P P, Minerva standing right on prow, brandishing spear and holding shield, owl at feet right. Titus Flavius Domitianus was the younger son of Vespasian and brother of Titus, whom he succeeded. Minerva is featured on many of his coins. Domitian is largely remembered as a monster and would-be god-king, a banal Nero in miniature. Like Nero, he was the end of his line. Put those extra gmail invites to good use! Bloggers with gmail invites to give away, consider donating them to the troops here and here. Α Κ Π ΛΙ ΟV ΓΑΛΛΙΗΝΟC ΕVΕVC, Laureate draped cuirassed bust right | L_Β, Homonia seated left holding double cornucopia right, raising hand left. Regnal year across fields. Homonia is equivalent to the Roman Concordia, seen here yesterday. 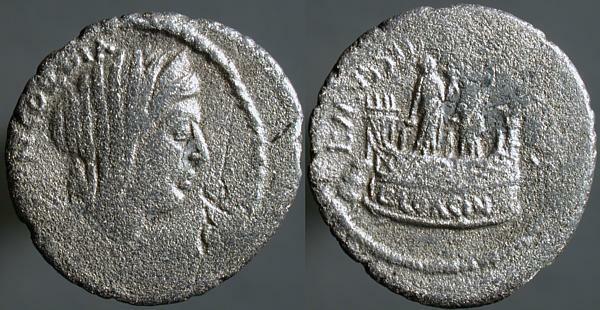 On Alexandrian coins she's usually seen, as here, with her hand raised in a Stop! In the name of love sort of gesture. 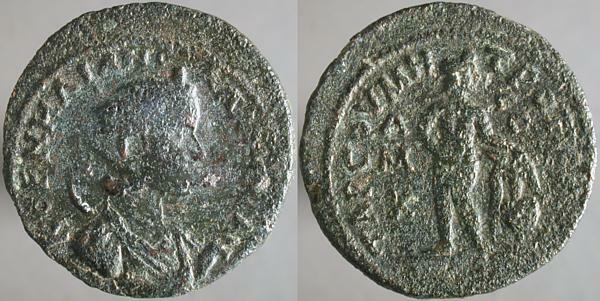 SALONINA AVG, Diademed draped bust right | CONCOR AVG, Concordia seated left, holding patera left and double cornucopia right. Concordia was a Roman goddess representing agreement and harmony. 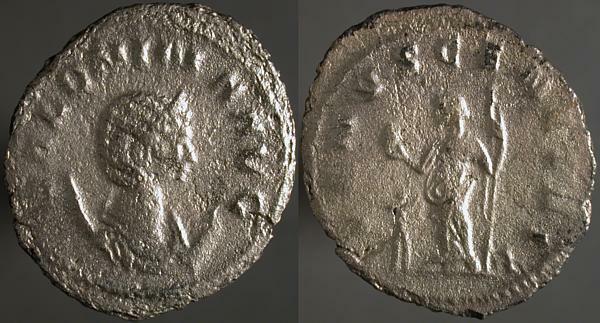 It's unclear to me if her appearance on a coin of an empress is meant to represent the happy state of the imperial marriage (which remains a bit of a question, as Gallienus apparently kept a more-than-concubine, less-than-wife, Pipa, or Pipara, daughter of a German chieftain), or a more general state of harmony. Useful pages on Roman dieties and personifications here and here. ΚΟΡΝΗΛΙΑ CΑΛΩΝΙΝΑ CΕΒΑ, Diademed draped bust right, eight-pointed star above, E countermark before | CΙΔΗΤΩ_Ν Ν_ΕΩΚΟΡΩΝ, Athena standing facing, head left, holding temple left and spear right, shield by her feet right. Here Athena holds what I presume is the Neokorate temple, dedicated to the cult of the imperial family, that the legend proclaims.